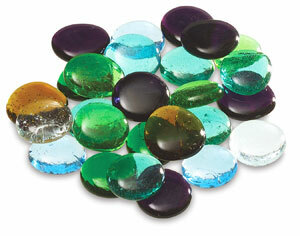 Brightly colored Glass Globs can be used for surface decoration, embedments, leading, unusual ornaments, and kiln work. The free-form round shapes are flat on one side, and approximately 1/8" thick. Transparent glass, assorted colors. 1 lb bag.